During the years following World War II, the population of school-aged children in the United States grew rapidly. Especially after Sputnik, many parents encouraged children to study science and mathematics, buying a wide range of objects. Some were new versions of devices like flash cards, chemistry sets, and microscopes that had sold for decades. Others, such as cards for teaching principles of physics through very simple experiments, and toys designed to convey basic computer logic, were new. Millions of children were born each year in the postwar United States. To house them, new schools were built and old ones were refurbished. At a time of unprecedented prosperity, families made and purchased a wide array of objects for the young. 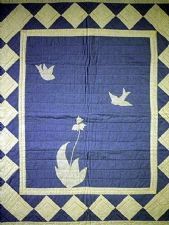 This baby quilt, with its botanical theme, was made by Dorothy Overall of Caldwell, Kansas. New parents, including scientists, sought to nurture the minds as well as the bodies of their children. 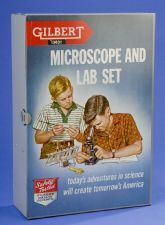 From the 1920s onward, the A. C. Gilbert Company of New Haven manufactured chemistry sets and other scientific toys. Mindful of the growing U.S. population, Gilbert introduced a new line of products the winter before Sputnik. There were three kinds of microscopes, eight chemistry sets, and five combined microscopes and chemistry sets. The kits came with chemicals and specimens, as well as detailed instructions about how to use microscopes and carry out basic chemical experiments. Not long after the launch of the Soviet satellite, Smithsonian specialist George A. Norton purchased this small laboratory as a Christmas present for his young daughter. She went on to become a mathematics educator. Gilbert soon introduced other "career-building toys" with more of a space-age emphasis. These included a small telescope, a star finder, and an Erector set rocket launcher. Attempts to popularize science in the home existed well before Sputnik or the baby boom. From 1940, Science Service, the science news agency, distributed monthly kits like these. The small boxes introduced substances and scientific ideas with objects. Each kit contained a few simple things, along with a pamphlet describing possible experiments and observations. Topics ranged from seeds to rocks to materials like carbon black and polypropylene to optical phenomena like holograms. Distribution initially was to 5,000 subscribers, but by early 1957 this number had risen to 20,000. The examples shown are from the mid-1960s, when subscriptions peaked at about 40,000 kits a month. Contemporary school curriculum projects also emphasized providing simple apparatus for teaching mathematics and science. Fun with Scientific Experiments, by Ira Freeman and Mae Blacker Freeman, 1960 To help parents encourage students to study science, the publisher Random House issued this set of 28 paper cards. Photographs on the front showed 12-year-old Robert Sells carrying out simple physics experiments with household objects. Text on the back described experimental procedures and the underlying scientific reasoning. A rocket and the Vanguard satellite appear on the box cover. The cards were based on a book of experiments written by the physicist Ira Freeman and his wife, the author Mae Blacker Freeman. The Freemans had been writing science books for children since the 1940s. Random House issued similar cards relating to chemistry, astronomy, rocks and minerals, and shells.